One of the less-discussed—but no less valuable—consequences of the explosive success of the craft beer scene in the States? It demonstrates that the business model might work in other countries. And if it works really well, that beer could find itself on the same U.S. shelf as the micro-brews that inspired it. 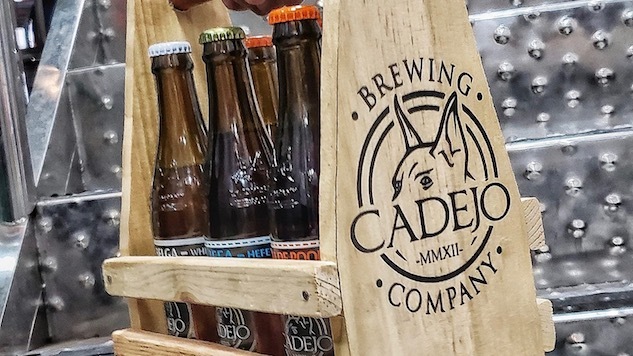 Such is the case with Cadejo Brewing, one of El Salvador’s most successful micro-brew operations, and one of the first beers to come from that country to the United States. El Salvador native and Cadejo co-founder, David Falkenstein, lived in the States for 17 years, where he was naturally exposed to the burgeoning craft beer scene, before returning to his homeland in 2009. Throughout the next three years, he plotted how he could start a brewery in his native El Salvador, potentially at a friend’s Irish bar. Annual trips to St. Louis to visit family also allowed him to tour local breweries and research the science/art hybrid that is modern beer-making, and three years later he founded Cadejo—not in the basement of some shamrock-laden bar, but as a stand-alone establishment. But his love of U.S. craft stayed with him. He loosely modeled one of his first brews, the WAPA wheat American pale ale, after Bell’s Two Hearted Ale. The other beer introduced during the launch was Roja, Spanish for “red,” which also looked to the U.S. for inspiration, and now that American red sits alongside more than 30 brews, including seasonals and one-offs. Today they have six year-round releases, and those have recently appeared in Maryland and Washington, DC, a region that boasts a high population of Salvadorians. But of course the beers aren’t specific to the Salvadorian palate. The WAPA is a refreshing, less hop-forward ale than its source of inspiration from the famed Michigan brewer, a more approachable summer-friendly pale. La Suegra follows a more traditional American IPA route, while the La Negra dips its toes confidently into darker styles. It comes with a modest 4.8% ABV and makes for a really drinkable not-too-bitter, surprisingly light Irish Dry Stout. The Hija De Pooh isn’t as sweet as its label, which proudly announces it’s a honey blonde ale, might suggest. But of the six new imports, the Mera Belga might be the best. The witbier drinks bright and grassy and tart, perfect for the scorching heat and humidity typical to the Mid-Atlantic locales where the beer is now being sold. The name of the brewery itself derives from Central American folklore. The cadejo is a supernatural character. According to legend, there’s a white cadejo (the good one), and the evil black cadejo, who are said to appear at night to travelers as large, shaggy dogs with burning red eyes and goat’s hooves. In the Salvadorian spin, the cadejo also is said to guard drunks against anyone who tries to rob them. And while that latter variation on the tale will certainly resonate with beer-lovers, Cadejo’s passage from El Salvador to the United States might also indicate that the white cadejo helped out on that years-long journey. Hopefully that good fortune will soon carry across the country.